WHO: Cynnabar populace, friends, family, and all interested parties (Gold Key loaner garb available). Please read this if you plan to bring a minor. REMINDER: Please wear garb, and please bring feast gear and a dish to pass. 12:30 PM - 4:00 PM: Armored and Rapier Fighting with tournaments at the Marshalls' and their Excellencies' Pleasure. 2:00 PM - 4:00 PM: Glass Bead Making with THL Terryl MacAodhagain - Please arrive at noon so you can receive safety instructions. Following a brief demo, participants can sign up for a time slot to try their hand at this ancient art form. If you are planning on watching or participating, glasses are required, either the prescription, sunglasses, or safety kind. This class does involve an open flame, so guard your garb and mind your minors. Don't forget to pick up your product at the end of the event! Come make money the medieval way, with a hammer! 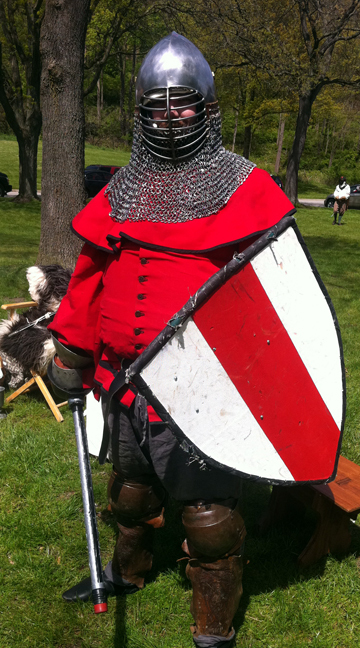 Master Derian le Breton will be striking coins for Midrealm 50th. 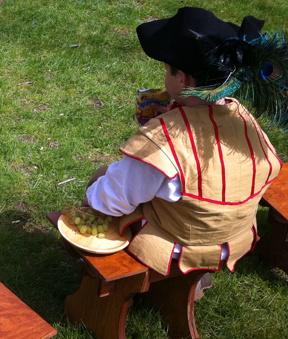 Catch him when he's not on the rapier field, otherwise you might be the one getting struck! Are you new and need some SCA things? Have you been around a while and are looking for change? Do you have garb, jewelry, feast gear etc. that you don't use any more? Please bring them and your cash to Spring Revel for the baronial yard sale!!! All proceeds will go towards gold key for garb, repair, and other items as needed such as feast gear, accessories, etc! Contact Ceara inghean Mhuirgheasa for more information, to offer a donation to the yard sale, or to volunteer to help with the event. You'll want to wear garb to Spring Revel. If you don't have garb, would you like to borrow some? The day ends with a potluck. Most people bring drinks and something to grill for themselves, plus a dish to share with others. Of course, all kinds of variations on this are okay! We acquired an alcohol license at the site, so if you would like to bring alcoholic beverages, please do. Also, if you bring a dish with potential allergens (eggs, fish, shellfish, citrus fruits, milk, tree nuts, peanuts, shellfish, soy, wheat, etc. ), please mark it as such. Because it saves paper waste and adds to the pre-seventeenth century feel of the event, we are encouraging everyone to bring their own feast gear to the potluck (instead of providing disposable dishes). For each person, you need a cup or mug, a plate or bowl, and silverware. It can also be convenient to bring napkins and some kind of container to store your dirty dishes after the meal. If you are bringing children with you, please read our youth policy--it's very important! Still have questions about the event? Please contact Alana Eleonora Aurora de Amelia, who is organizing Spring Revel, or Bantiarna Ceara, our Newcomer Liaison. Or post something to the event's Facebook page! Whether you're a newcomer to our fair Barony or are just curious about who we are and what we do, we invite you to join us at our Spring Revel! This is a wonderful opportunity to meet us in a casual atmosphere and observe our fighters and artisans, lords and ladies, doing what they love best. If you're interested in joining at the Spring Revel and you're new to Cynnabar and/or the SCA, send an e-mail to me (Chatelaine/Newcomer Liaison) so I can welcome you and help you get some garb for the event!